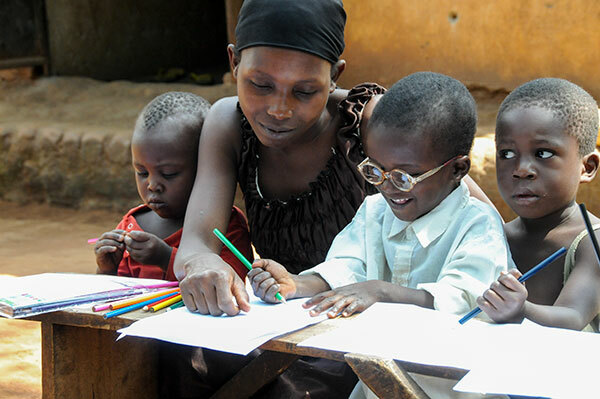 Gafaro was born with double cataracts. By the time he was four years of age the left eye could only see little bits of light and colour. His right eye was completely blind. Poisonous snakes, biting ants, open fires, speeding boda bodas (mopeds) were just some of the dangers Gafaro—a young, curious child—faced. His mother lived in constant fear for his safety. They live in a dark, four-room house with his two siblings, two cousins, aunt, uncle, and grandmother. His father abandoned them. Because of Gafaro’s limited vision and no electricity to brighten the house, he was completely blind inside the place he calls home. The family survives on a variety of vegetables they grow from peasant farming. The cassava, maize and potatoes are just enough to barely feed the family—not enough to sell at the market. Gafaro tried to help his mother, Rashidah, and grandmother, Zulaika, in the garden, but he couldn’t distinguish between a weed and a plant. He accidently pulled out the vegetables. While his siblings and cousins attended school, Gafaro sadly played by himself in the sand on the floor of the house. Or he stacked bricks and filled little containers with dust. The neighbourhood children didn’t visit him. When they saw him on the compound, they laughed at him. After school, his cousins and siblings attempted to play with Gafaro. But, they’d become frustrated. “He can’t do the things they expect him to do, he accidently destroys things—and then they sometimes push or hit him,” his mother said. Before he retired to bed, Gafaro sang and then imitated the things the other children told him about school. He so desperately wanted to play and learn along with the other children. The family heard that a doctor at the Mengo Eye hospital would likely be able to help Gafaro. So, they scraped together the few shillings they had to pay for the taxi ride to the hospital. The doctors told them Gafaro needed surgery ASAP. He would become permanently blind if they waited too long. But, the surgery was unaffordable for them. They returned home, sad and disappointed. Then Hope and Healing International worker, Tobias Pflanz found him. What a glorious day! Supporters like you funded the surgery and the follow up care Gafaro so desperately needed. The family couldn’t believe their ears! All for free? How they felt the love of Jesus through supporters at Hope and Healing International. On the day of surgery, Rashidah assists her son as usual. She packs a few clothes in a blue plastic bowl. They don’t own a bag or a suitcase. Dr. Rose performed cataract surgery on both of Gafaro’s eyes during the same operation under general anesthetic. The following morning, Gafaro is in a lot of pain. After removing the eye patches, it’s impossible for the nurses and doctors to examine him. He fidgets too much. His mother, uncle and Gafaro go outside into the sun. 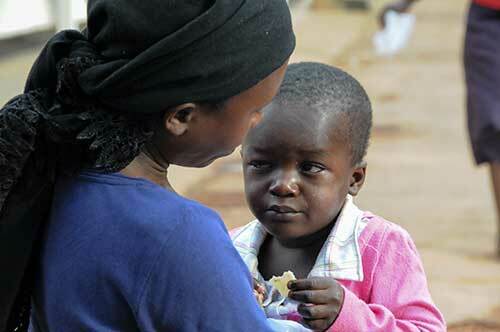 His mother treats Gafaro to a chapatti and some juice. He climbs on his mother’s lap. He savours the pancake made of four and water. Slowly, he opens his eyes. The left one wider than the right one. He looks into his mother’s eyes. He stares at her for a while in silence. Gafaro doesn’t smile just yet. He squirms off his mother’s lap and then stands in front of her for a while, looking up at her. He then walks towards some flowers. He stops in front of them. “He can see the flowers,” Rashidah rejoices. Next, Gafaro walks towards one of the parked cars. He leans his forehead against the dark varnish on the side of the car and smiles at his reflection. He keeps running back and forth between his mother, his uncle, and the car. All his tiredness and pain seem to have disappeared. Then Gafaro sees a puddle. He dashed towards it and jumps across the puddle again and again. A few times he misses the jump and lands in the middle of the small pool. He laughs with joy as the dirty water splashes all around him. In the meantime, two hours have passed. Gafaro is expected to see Dr. Rose again. At his mother’s prompting, he walks proud and unassisted into the doctor’s office. Gafaro is too excited to be examined. He escapes the office and runs outside to go back to playing in the puddles. “It seems your son is independent now, “Doctor Rose says to Gafaro’s mother and uncle. Everyone laughs. He’ll continue to be followed up by the clinic for infection, for treatment of his lazy right eye and to be fitted with glasses. In the meantime he’s able to go home. 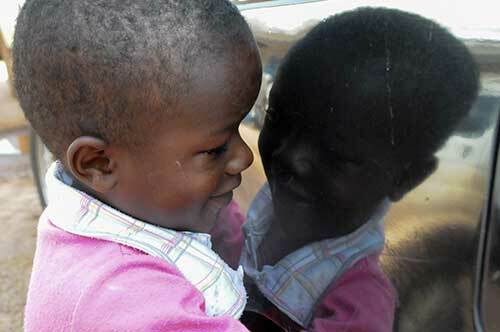 While seated in the back of a CoRSU hospital’s car with his mother and uncle, Gafaro occasionally looks out the window. Houses, mopeds, Lorries and many people race by. All of these things he can see for the first time in his life. It’s a little overwhelming. He closes his eyes and leans against his mother. The car pulls up onto the compound. Grandmother Zulaika runs towards the car. Her jaw drops and her eyes widen as she watches Gafaro get out of the car with only minimal help from Rashidah. “It’s a miracle! He can see!” Zulaika claps her hands and cries with joy. She runs after him. Gafaro stops abruptly at the entrance door to the house and silently looks at a girl he has never seen before. “Who is this?” he asks his grandmother. “That’s your cousin,” Zulaika answers. The girl starts talking. Gafaro beams. Before the workers leave, the Gafaro family want to give them a present. They wrap up a jackfruit from their garden with banana leaves, and tie it with blades of grass. “We’re endlessly grateful for the great work all of you have done for our little Gafaro. We don’t have much and don’t know how to show our gratitude. We would never have had the money for the surgery,” grandmother Zulaika says while handing over the present. “A miracle,” grandmother Zulaika whispers. That Fall, Gafaro started school with the other children…for the first time.